How far do you live from Eastern Market? Two blocks… Two thousand miles? Wherever you live, here’s a fun family activity that connects you to Eastern Market! Click the link below and print out a cow of your favorite color. Cut it out and take it to your second favorite place (wink, wink)! Take a picture of you holding the cow and upload it to our Facebook FanPage! Let’s see how far and wide the Eastern Market community really is! 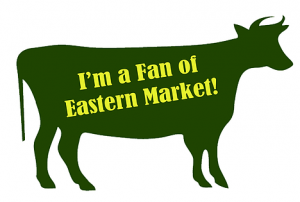 Click Here to Download an Eastern Market Cow! And for our produce-loving fans…. Click Here to Download an Eastern Market Apple!